Whether you already have a dog or you’re in the market for one you probably already know that dogs are pretty great. Sorry for you cat lovers out there, but this post is going to be all about our furry canine friends! I could go on and on about the cliché reasons dogs are oh so fabulous, but this is going to be for the more humorous crowd who are just OBSESSED with their dogs. If you’re not already obsessed with your dog, here are some ideas to connect with your dog on a whole new level. Dog owners are making more and more pages for their pets than ever before. You can even make your dog INSTAFAMOUS. Why keep all the adorable photos to yourself when you can share them with the world? Other people can bask in the cuteness of your furry friend. Many pets even have more followers than their owners nowadays because who can’t say no to that adorable puppy dog face. A while back I saw an owner put a picture of his dog’s face and printed it on a t-shirt and then put a picture of his own face on another t-shirt. They then wore each other’s t-shirts and just hung out together for the rest of the day. That’s true love right there. I am a huge fan of corgis. With their stubby little legs and their energetic demeanor, who isn’t? Recently, I found out I’m not the only one. This year I discovered there’s such a thing called Corgi Beach Day – and it’s exactly what it sounds like. It’s a beach filled with hundreds of corgis and some non-corgis too. You are in a sea of corgis, where you can bond over the fact that you came to an event literally centered on the fact that everyone there LOVES corgis. What could be better than that? It’s true when they say a dog is a man’s best friend. Dog’s are ALWAYS willing to hang out with you and go places. They are extremely loyal and excited to go on adventures, especially if there’s a walk or food involved. Have no one to go on a picnic with? Take your dog. Want to go on a hike? Take your dog. Want to Netflix and chill? Your dog is the best companion. Want to go to a bookstore? Take your dog to Bookmans. Personalization can be added to pillows, phone cases, blankets, and more. Anything you can think of that can add a personal touch (and have your dog’s face on it). Yes, people do celebrate their dog’s birthdays and make a BIG DEAL about it. You can too. Don’t forget the party and birthday cake! Your dog will know if you forget their birthday. These are just a couple of the things you can do to bond with your dog. IMHO, dogs are just the best and are absolutely worth centering your life around. 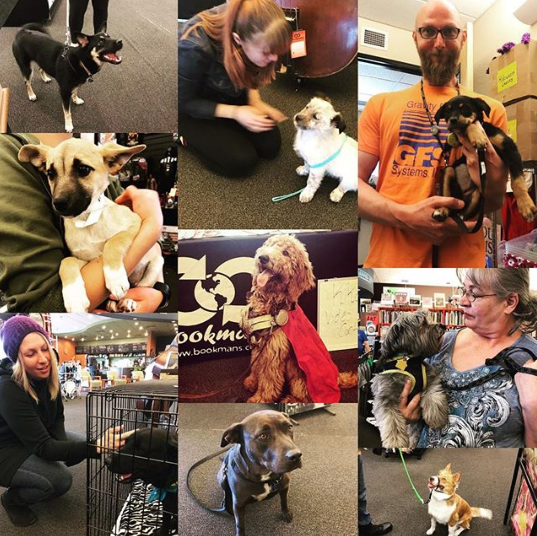 Many Bookmans locations have monthly pet adoption events too so if you don’t already have that special furry friend to do all these fun activities with you can soon! You’d also be giving a deserving animal a home. That’s a win-win for both you and your new furry friend! Here at Bookmans, we love animals and we love to show it. How about you?